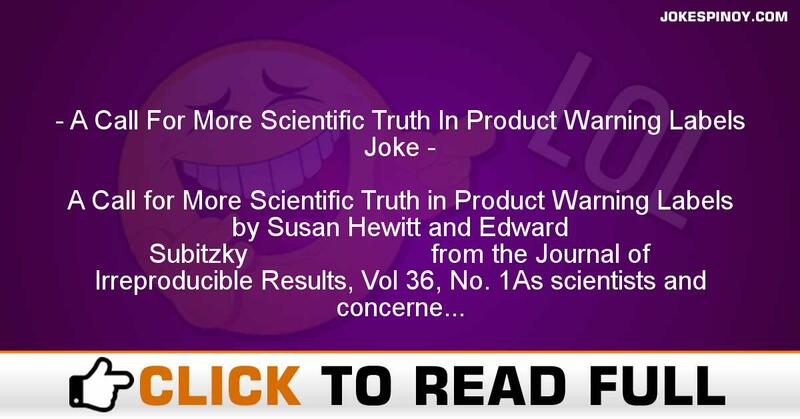 A Call for More Scientific Truth in Product Warning Labels by Susan Hewitt and Edward Subitzky from the Journal of Irreproducible Results, Vol 36, No. 1As scientists and concerned citizens, we applaud the recent trend towardslegislation that requires the prominent placing of warnings on products that present hazards to the general public. Yet we must also offer the cautionarythought that such warnings, however well-intentioned, merely scratch thesurface of what is really necessary in this important area. This is especiallytrue in light of the findings of 20th century physics.We are therefore proposing that, as responsible scientists, we join together inan intensive push for new laws that will mandate the conspicuous placementof suitably informative warnings on the packaging of every product offeredfor sale in the United States of America. Our Suggested list of requiredwarnings appears below.Warning: This Product Warps Space and Time in Its Vicinity.Warning: This Product Attracts Every Other Piece of Matter in the Universe,Including the Products of Other Manufacturers, with a Force Proportional tothe Product of the Masses and Inversely Proportional to the DistanceBetween Them.Caution: The Mass of This Product Contains the Energy Equivalent of 85Million Tons of TNT per Net Ounce of Weight.Handle with Extreme Care: This Product Contains Minute ElectricallyCharged Particles Moving at Velocities in Excess of Five Hundred MillionMiles per Hour.Consumer Notice: Because of the ‘Uncertainty Principle,’ It Is Impossiblefor the Consumer to Find Out at the Same Time Both Precisely Where ThisProduct Is and How Fast It Is Moving.Advisory: There is an Extremely Small but Nonzero Chance That, Through aProcess Known as ‘Tunneling,’ This Product May Spontaneously Disappearfrom Its Present Location and Reappear at Any Random Place in theUniverse, Including Your NeighborUs Domicile. The Manufacturer Will NotBe Responsible for Any Damages or Inconvenience That May Result.Read This Before Opening Package: According to Certain SuggestedVersions of a Grand Unified Theory, the Primary Particles Constituting ThisProduct May Decay to Nothingness Within the Next Four Hundred MillionYears.This is a 100% Matter product: In the Unlikely Event That This MerchandiseShould Contact Antimatter in Any Form, a Catastrophic Explosion WillResult.Public Notice as Required by Law: Any Use of This Product, in Any MannerWhatsoever, Will Increase the Amount of Disorder in the Universe.Although No Liability Is Implied Herein, the Consumer Is Warned That ThisProcess Will Ultimately Lead to the Heat Death of the Universe.Note: The Most Fundamental Particles in This Product Are Held Togetherby a ‘Gluing’ Force About Which Little Is Currently Known and WhoseAdhesive Power Can Therefore Not Be Permanently Guaranteed.Attention: Despite Any Other Listing of Product Contents Found Hereon,the Consumer Is Advised That, in Actuality, This Product Consists Of99.9999999999% Empty Space.New Grand Unified Theory Disclaimer: The Manufacturer May TechnicallyBe Entitled to Claim That This Product Is Ten-Dimensional. However, theConsumer Is Reminded That This Confers No Legal Rights Above andBeyond Those Applicable to Three-Dimensional Objects, Since the SevenNew Dimensions Are ‘Rolled Up’ into Such a Small ‘Area’ That TheyCannot Be Detected.Please Note: Some Quantum Physics Theories Suggest That When theConsumer Is Not Directly Observing This Product, It May Cease to Exist orWill Exist Only in a Vague and Undetermined State.Component equivalency notice: The Subatomic Particles (Electrons,Protons, etc.) Comprising This Product Are Exactly the Same in EveryMeasurable Respect as Those Used in the Products of Other Manufacturers,and No Claim to the Contrary May Legitimately Be Expressed or Implied.Health Warning: Care Should Be Taken When Lifting This Product, SinceIts Mass, and Thus Its Weight, Is Dependent on Its Velocity Relative to theUser.Important Notice to Purchasers: The Entire Physical Universe, IncludingThis Product, May One Day Collapse Back into an Infinitesimally SmallSpace. Should Another Universe Subsequently Re-emerge, the Existence ofThis Product in That Universe Cannot be Guaranteed. ABOUT US : Laughter is the greatest medicine as the old expression says, we at JokesPinoy.com will supply you with all the funny filipino quotes and photographs in tagalog language. Back in 2013, a group of Filipino OFW (Overseas Filipino Worker) got bored and they attempt to look for some humorous quotes on the internet simply to have fun but unfortunately most of the websites they discovered on that time are having an outdated jokes and have no interaction with the users. From that moment, they then got an idea to build their own jokes website and let other users to give their jokes or opinion together with the existing jokes. After the funds and ideas gathered, JokesPinoy.com was born, a website that let the user share their jokes and let them have dialog with other users too. Since the website has been launching, tens of thousands of visitors are coming each day to read jokes and have fun on the website and also as giving their view on the jokes they read. We hope from JokesPinoy.com that this website may give you some grin and happiness, Life is Short so have fun on it. DISCLAIMER: A number of the jokes, pictures and videos seen in this site are not created by us, they're created by our users or they simply get it someplace in the net only like 9gag, youtube, metacafe, vimio and etc. We regard copyright info that is posted here including funny pictures and humorous videos. If encase there are files posted here in our site that is possessed by your and you do not desire to share it to anybody subsequently fell free to contact us to remove it. Majority of the language used on this particular site was in tagalog and some are bisaya that are both filipino language which originated from Philippines, in case you need to interpret the joke to english you can used an online translator to translate it from tagalog to english.